Agni is one of the playable Gods in SMITE. Though the source of his origin warrants debate - for there are many tales of his parentage ranging from two simple sticks rubbed together, to the cosmic energy that made all things at the beginning of time - Agni is a pivotal and important God with many duties to the Pantheon. He is the twin brother to Indra, God of the Heavens and Rains and chief among warriors. Conversely, Agni is chief among priests, acting as messenger between mortals and Gods. Every Hindu ritual and prayer is performed in front of a fire of some kind, so Agni carries the words and sacrifices, traveling between the Earth and the Heavens. He is welcome in every home and every hearth and much beloved by the Faithful. Deals a total of 30 (+60% of your magical power) damage. Can deal up to 100/200/300/400/500 (+50% of your magical power) damage to a target that stays in the area for its full duration. Persists for 1s after it is cast. Can deal up to 80/120/160/200/240 (+60% of your magical power) damage. The DoT effect refreshes every time the target touches the burning trail. The halo recharge rate is affected by Cooldown Reduction. As Agni stun three or more gods with Noxious Fumes. One of Agni's jokes, "Only you can prevent forest fires. Well... Unless I'm around. ", is probably a reference to the 1980's Smokey the Bear commercial. This is one of the few Tier 1 skins with custom ability effects. This skin received a remodel some time after Agni himself was remodel. 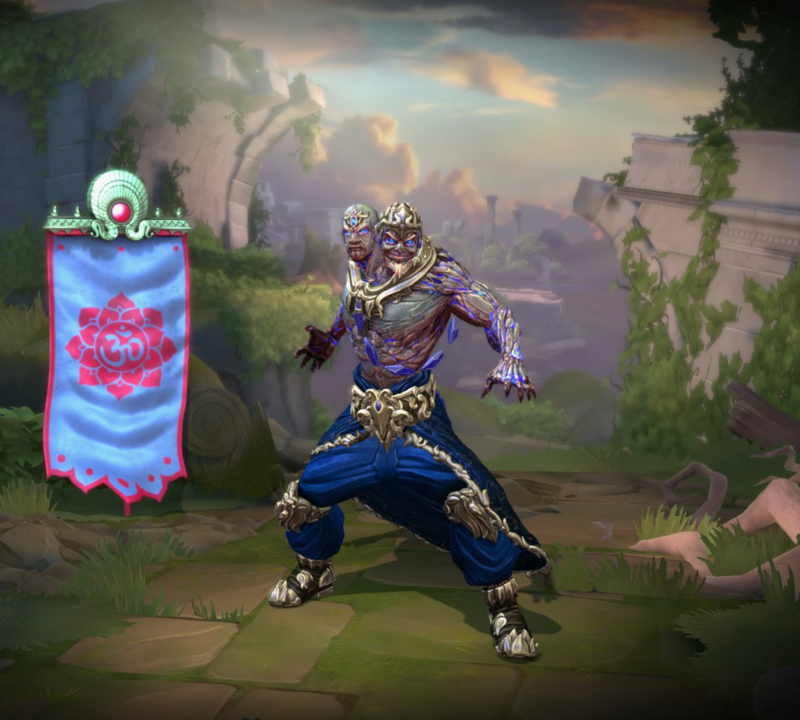 This skin preserved Agni old Walk animation. 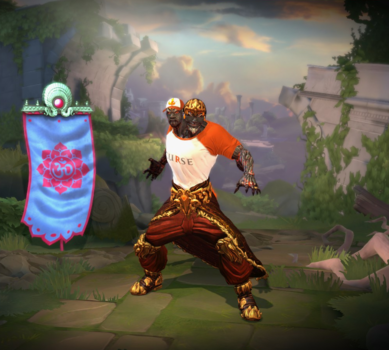 Agni's Swagni skin originated from players calling Agni's old model Swagni, due to his original walk animation. The skin's walk animation also references this. In this skin card art, Afro-Dite Aphrodite and Neith can be seen with Swagni. There is an announcer pack themed after Agni's Swagni skin, given as a reward for gathering 6,000 Fantasy Points for the Season Ticket 2015. 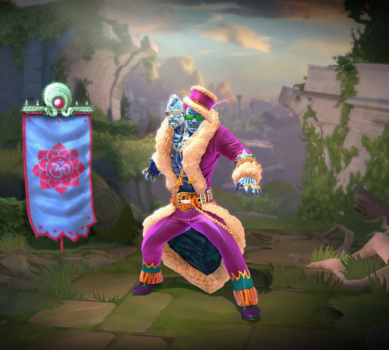 It can be heard here: Swagni Announcer pack. One of Swagni's quotes when he uses his 1st ability, "Can you dig it, sucker! ", is a reference to a quote made in the film The Warriors. One of Swagni's quotes when he uses his 2nd ability, "Swagni Pimp Slap! ", is a reference to the saying Pimp Slap. Swagni's quote when he uses his ultimate, "Make it rain! ", is a reference to the saying and song with the same title Make It Rain by singer Fat Joe. One of Swagni's taunts, "You play with fire, you might get burned. ", is a reference to the saying Play with fire. 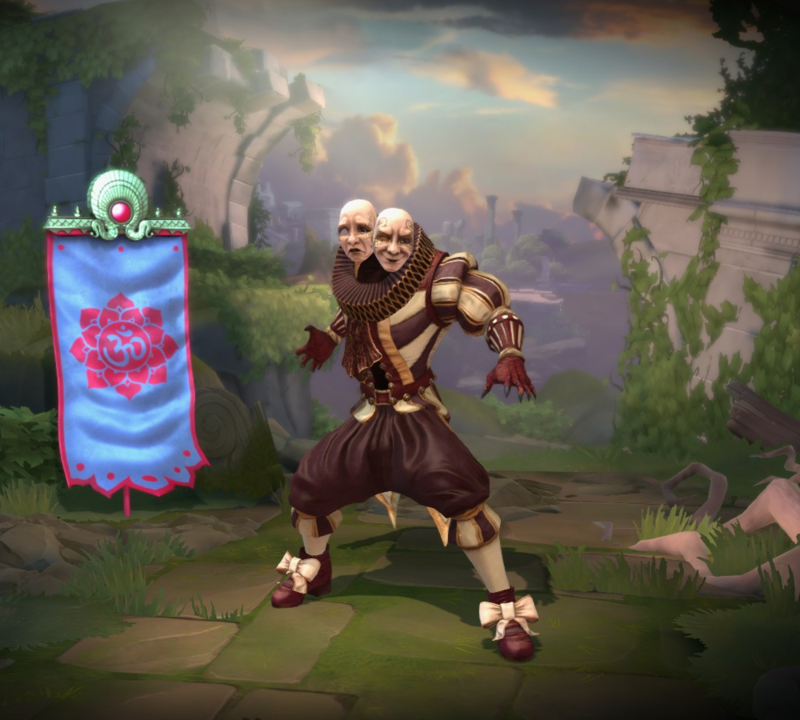 Most of this skin lines of this skin are taken directly from Shakespeare plays. The name of this skin was based on the constellation of Gemini. This skin directly taunt to Chiron "Return to the stars, great teacher." is a reference to Chiron's lore where he becomes the constellation of Sagittarius after his death. 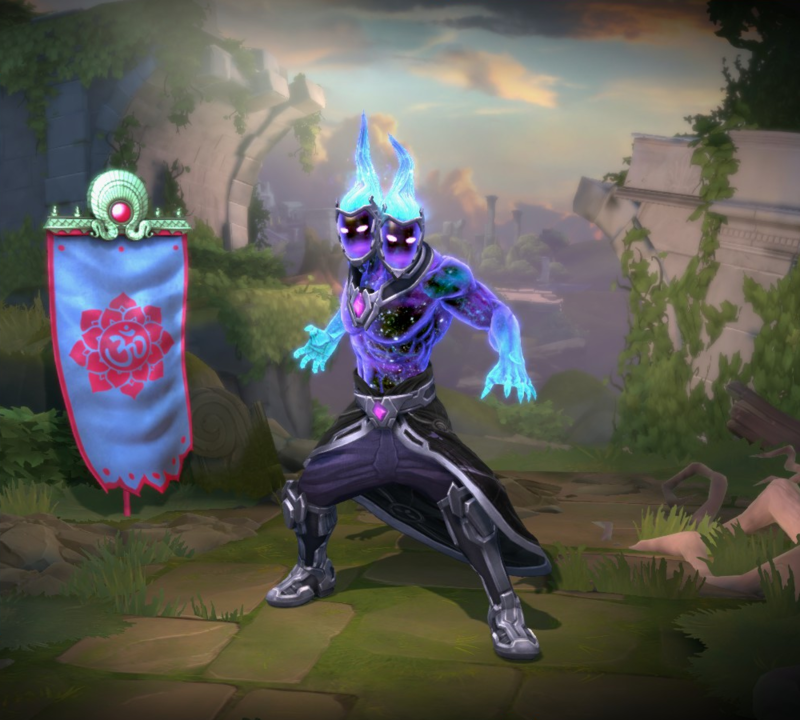 This skin shares it's theme with Cosmic Power Anubis, Galactic Void Chernobog, Cosmic Conqueror Hercules and Nebula Medusa. Agni's Infernal skin is a possible reference to the character Human Torch from Marvel Comics' The Fantastic Four. One of Infernal Agni's Warding quote, "Ward on! ", might be in reference to the Human Torch's catchphrase, "Flame on!". One of Infernal Agni's taunts, "Go hot or go home! ", is a altered version of the title of the song Get Hot or Go Home. More specifically, this skin could be based on one of Lovecraft books, The Dunwich Horror. This skin shares it's theme with Eldritch Ra, Abyssal Sorcerer Poseidon and Abyssal Warrior Sun Wukong. 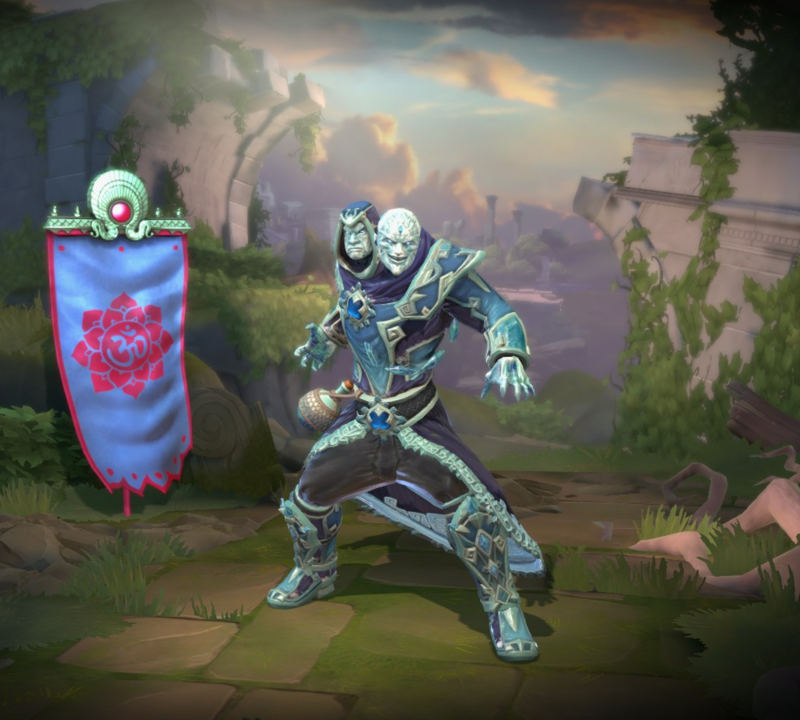 This skin is unlocked with a special code awarded for playing a minimum of 10 matches while using Curse Voice. This skin was part of the SWC 2016 Digital Loot Pack bundle. This skin could only be obtained by unlocking 12 or more items from the Odyssey before January 9, 2015. 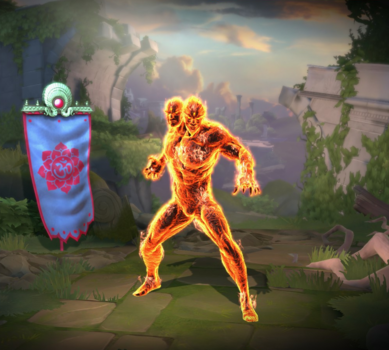 Fixed an issue where the active duration of Flame Wave was not correct while using the Abyssal Acolyte skin. Decreased damage from 160/195/230/265/300 to 140/180/220/260/300. This damage dealt by this ability now triggers "on ability hit" effects. Decreased mana cost from 60/70/80/90/100 to 60/65/70/75/80. Increased persist time of Flame Wave from .5 → 1s. Increased scaling from 50% → 65%. Increased base Attack Speed from 0.86 → 1. Decreased % increase of Attack Speed per level from 1.01 → 0.95. Added achievements ‘The Heat!’ and ‘Those Fumes’. The Volcanic Agni skin has been updated. Fixed missing fire fx playing in lobby. Fixed an issue where his cooldowns were not showing up on tooltips. 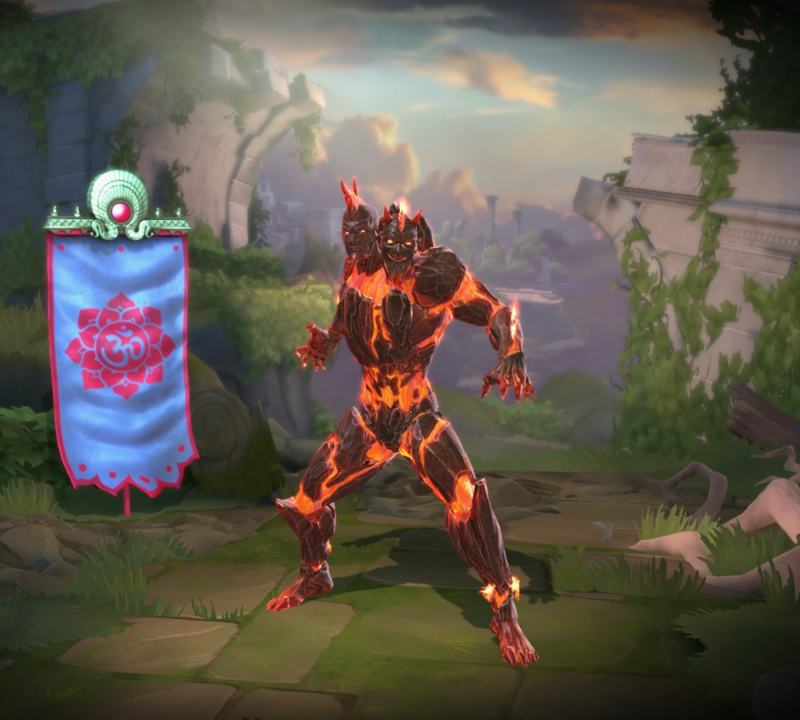 Made Agni ‘Infernal’ skin look better on Low settings. Fixed an issue where Agni could not target this ability inside tower or wall collisions. Added targeters for Volcanic skin. Casting time reduced from 0.3s to 0.2s. Fume cloud deploy time reduced from 0.1 to instantaneous. These changes should help land his Ultimate stun combo. Agni is no longer crowd control immune, but is instead immune to Knockback during this dash. Thumbnail/Portrait Icon has been updated. Buff icons removed for the Ultimate (since the need for these were eliminated by the new passive meter). Fixed an issue with his run speed not updating on the HUD. Fixed a minor FX issue with the Incinerator skin. Switched this ability to no longer use Continuous Fire. In Quick Cast mode, left clicks occurring a short time after a meteor is cast will no longer fire another one, instead always firing basic attacks. In standard targeting mode, clicking and holding the mouse will no longer fire multiple meteors uninterrupted if they are available. Re-fixed the issue with not animating for every shot. Volcanic skin will still have the issue in Solo Practice matches. Fixed an issue in which the recovery time was not correct, making it more difficult to place Noxious Fumes down in time after using Rain Fire. Agni's model, animations, 2D Art, and FX have all been updated. Agni's passive meter has been updated include a timer indicating how many seconds until your next meteor becomes available. Agni's Incinerator, Golden and Legendary skins have been updated for the new model. Agni's Volcanic skin has kept the same model and animations as previous, but has some FX updates. Recovery time reduced from 0.6 to 0.4. Should help higher ping players be able to place Noxious Fumes down in time after using Rain Fire. Fixed an issue where firing multiple meteors would skip animations. Casting time increased from 0 to 0.3. Recovery time reduced from 0.7 to 0.6. Damage reduced from 175/215/255/295/335 to 160/195/230/265/300. Adjusted the targeter to better indicate the area that will deal damage. The warmup hit area indicator FX now shows 0.5s earlier for both friendly and enemy players. Note: The warm up did not get longer, the FX are visible earlier (more warning). Fixed an issue where the damage over time passive was not applying to targets up close. Fixed an issue where he wasn't completely crowd control immune during the dash, like vs Ares ultimate. Polynomicon passive now works with this ability. Agni's passive now has an improved UI treatment. The Incinerator skin has updated FX. Description updated to accurately show the damage on the skill screen. FX have been updated for looks and performance. A bug has been fixed that allowed this ability to do double damage under some conditions. Fixed a bug in which Agni's basic attack was dealing true damage. Base damage increased from 80/120/160/200/240 to 90/140/190/240/290. Magical power contribution increased from 40% to 50%. Reduced the duration of the stun from 2s to 1s. Amount of time the flames are on the ground has been reduced from 4s to 3s. Range has been reduced from 70 to 65 feet. Damage done per tick has been reduced from 25/35/45/55/65 to 20/30/40/50/60. Fixed animation issue with firing consecutive meteors. Fixed timing difference between holding down the button to fire 3 consecutive meteors versus clicking the button 3 times. It now takes Agni .8s to fire a meteor (up from .5s). Tweaks to make the stun combo easier to perform. Reduced the cooldown from 15s to 12s. Cooldown changed from 14s to decreasing cooldowns per rank, 15/14/13/12/11s.